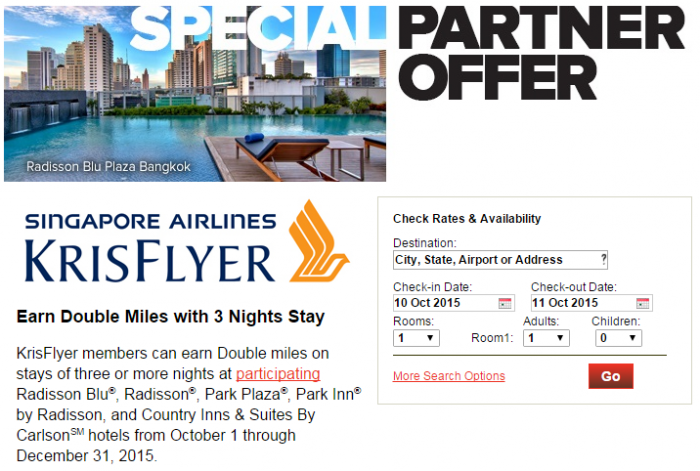 Club Carlson has launched a double Singapore Airlines KrisFlyer miles offer for stays of minimum of three nights. This offer is valid at select hotels mainly in Asia Pacific, Europe, Middle East & Africa for stays between October 1 – December 31, 2015. You can make your Radisson bookings here and access this offer here. Note that you must elect to earn miles instead of Club Carlson points and give the front desk your Singapore Airlines KrisFlyer number (and hope for the best). I would not choose miles instead of points due to the minimum stay length required in this offer. For stay of one night, earning 1,000 Singapore Airlines miles (500 base + 500 bonus) would have been fine, but not for longer stays. The “Earn Double Miles” promotion (“Promotion”) is valid for 500 bonus KrisFlyer miles on Qualifying Stays at participating Radisson Blu, Radisson and Park Plaza hotels and 250 bonus KrisFlyer miles on Qualifying Stays at participating Park Inn by Radisson and Country Inns & Suites By Carlson hotels (collectively the “Participating Properties”) between October 1, 2015 and December 31, 2015 (“Promotional Period”). A Qualifying Stay is a stay of three or more nights at a Participating Property at a minimum qualifying rate, booked with the promotional code KRISFLYE on this website. Excluded from this Promotion are stays booked on airline flight crew, employee, travel agent and wholesale rates; complimentary rooms; and rooms booked on third party websites. You must present your KrisFlyer membership number at check-in. Bonus miles are in addition to the standard miles per Qualifying Stay. Rates for each night may vary. Participating Properties are subject to change without notice. Offer subject to availability and blackout dates may apply. Club CarlsonSM Gold Points® may not be earned for Qualifying Stays under this Promotion. To the maximum extent permitted by law, Carlson Hotels, Inc. reserves the right to add, modify or discontinue these terms and conditions or the Promotion with or without notice. Void where prohibited by law. By participating in this Promotion, you agree and consent to these terms and conditions. Allow six (6) to eight (8) weeks for miles to post to your account.